"This heart cookie recipe is from Germany where they are called Herrnhuter Herzen. They are the perfect cookies for Valentine's Day or other romantic occasions." Combine flour, 1 cup plus 2 tablespoons butter, white sugar, and eggs in a large bowl and knead into a smooth dough. Shape into a ball. Flatten, cover with plastic wrap, and refrigerate for 2 hours. Preheat oven to 375 degrees F (190 degrees C). Grease 2 baking sheets or line with parchment paper. Dust a work surface with flour and roll out dough to 1/4-inch thickness. 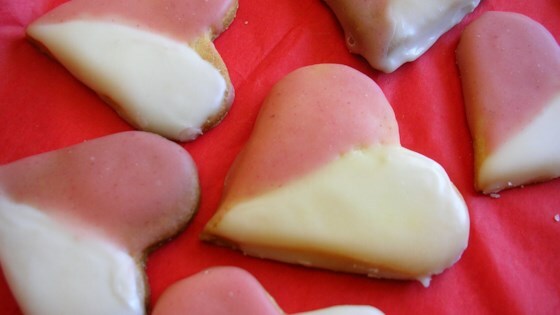 Cut out hearts with a heart-shaped cookie cutter and arrange cut-out cookies on prepared baking sheets. Bake in the preheated oven until lightly browned, 10 to 15 minutes. Remove from baking sheets carefully and transfer to wire racks. Cool completely, about 20 minutes. Mix 1 cup of confectioners' sugar with as much lemon juice needed to form a thick icing. Cover half of the hearts with the white icing. Mix the remaining 1 cup confectioners' sugar with raspberry syrup and cover the other half with pink icing. Let cookies stand until icing dries completely, about 2 hours, or up to overnight.